« Two new shows – Tickets on sale now! And the goat remained a goat! The Secret Society is going to stage a strange and haunting show. 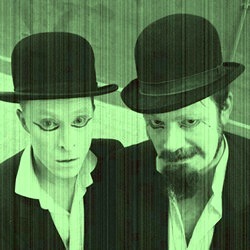 On Tuesday 29th July, Richard will team up with musicians The Creative Martyrs (‘darker than the inside of a bowler hat’) to present a spine-tingling evening of entertainment! Based on the real-life adventures of 1930s psychic investigator Mr Harry Price, this show will involve the performance of prestidigitation, oodles of creepy music, the projection of rare film footage, and a smattering of paranormal happenings. Come along and discover the secrets of the seance room, the truth about the world’s most haunted house, and whether it’s possible to transform a goat into a prince. The performance will be at 7.00 p.m., last about an hour, and take place at a secret location in the centre of Edinburgh. We will email you details of the venue after you have booked a ticket. Tickets are just £5 however, there are a VERY limited number of places, so if you want to come along, please grab a ticket when they became available on this site at 10am on Thursday 24th July. However, do be quick because our last event sold out in a few minutes. Due to the nature of the venue, you must be over 18 years old to attend. This entry was posted on July 21, 2014 at 9:14 pm and is filed under Uncategorized. You can follow any responses to this entry through the RSS 2.0 feed. You can leave a response, or trackback from your own site.